Here at VideoGamePerfection.com we’re super excited about a new product that we hope to be able to offer soon. 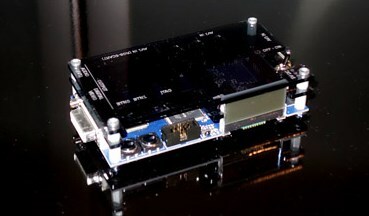 The Open Source Scan Converter (OSSC) shown here on the left is a new upscaling device created by a hardware engineer wizard who goes by the handle of “Marqs”. If you’ve not heard about this device, you need to know that it can upscale 240p and 288p games with zero input lag (well, maybe a millisecond or so). It does this in a similar way to the old Micomsoft XRGB scalers, by simply line doubling the 240p/288p content and adding an optional scanline overlay. Unlike the old XRGBs however, the device has full digital output and works with all RGB sources (no problematic PC Engine or Sega Master System here!). We’re expecting a test unit sometime later this week or early next week, at which point we will have lots more coverage. If you’re interested in learning more about the unit or ordering one, you should subscribe to the OSSC Mailing List and you can do so by visiting this page. Nice, but what’s important in this case: Will the price tag be the same as a Micomsoft XRGB scaler? It will be significantly cheaper than the XRGB Mini. any ballpark on when pre-builts will be available and rough ballpark of price? so its now late May any updates? links? Are you subscribed to the newsletter and Telegram channel?